3D Cast Resin Letters, 3D Styrofoam Letters, Polystyrene Letters. Contact us by email or phone to ask for advice or get a quote. Tel: 01202 546540. 3D Moulded letters available in a range of acrylic colours and fonts. in gold and in a font named Times Bold Bevel Face. Moulded lettering is made from 3mm thick cast acrylic. Letters may be custom made to any font of your choice but there would be a setup charge. 3D Logos can also be produced in acrylic subject to a setup charge. Link to main page for moulded letters. 3D Letters, moulded 3D letters are supplied with locator fixings on the back, a stud and cap system of fixings. A paper template is also supplied. 3D Letters are available in stainless steel. 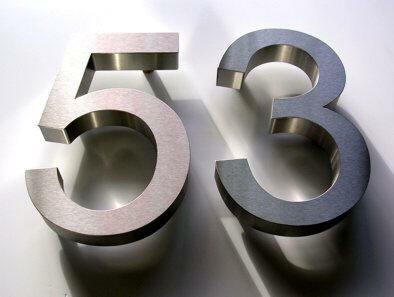 3D letters made from stainless steel come in any font and sizes from 25mm up to 1200mm high. 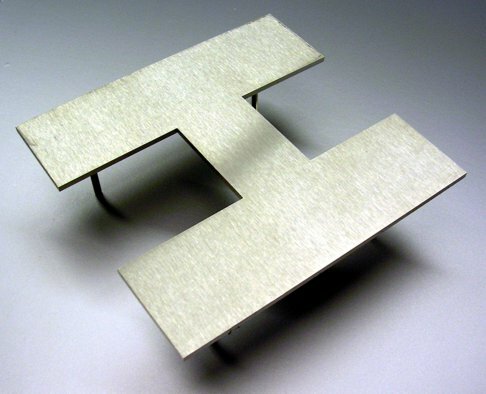 3D letters made from stainless steel are cut in 1.5mm thick, 2mm thick and 3mm thick material. The letters are supplied in either brushed finish or bright polished finish. The 3D Metal Letters have brass locators on the back or 4mm stainless steel rods, welded to the backs. The letters are supplied with a paper template. 3D Built up stainless steel letters. in a san-serif type font like Arial Bold. Serif fonts can be made and script fonts. Logos are also available subject to site of artwork. 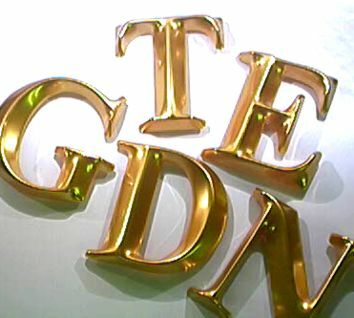 3D Metal letters built up give a professional image and should last a life time. These 3D letters come with a brushed finish or are available with a bright polished finish. The letters are welded together not glued. The fixings on the back are brass locators or rod fixings. 3D Letters made from 5mm thick cast acrylic. come in sizes from 25mm up to 2000mm high. The letters are supplied with stand of fixings and paper template. Acrylic letters information and prices. 3D Letters. Built Up Acrylic Letters. Red Letter S, 300mm high, 50mm returns. Made from 3mm thick acrylic, Arial Font. For Shop Front Sign. Supplied for DIY fitting. correct shape to follow the edge of the letter. We make it, you fit it. Polystyrene Letters are made to order. We use EPS Foam in HDFRA grade which is fire retardant. The letters are made in any font of your choice up to 1100mm high. The foam can also be painted or vinyl card faced. they can also be used for outside use when coated with an acrylic resin. RAL, BS or pantone colours charts.